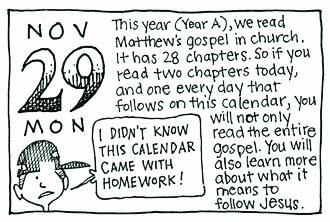 Welcome to Goshen College Advent Devotions 2012: Beginning Nov. 26. Some of you follow the Advent Calendar. Some of you do not. Some have never heard of it and others are formulating their response to me for even mentioning it in “Free Church” circles. Advent is a way of preparing individuals, families, and churches for the coming of the Lord Jesus Christ. This is done through the lens of the coming Messiah. In other words, we continue to prepare ourselves for the Lord’s return through the event of Christmas and during the days leading up to Christmas, we express faith in various ways, scriptures, prayers, acts of service.